It’s funny to think about, but the humble t-shirt has come a long way. Where once it functioned solely as men’s underwear, it has ascended the ranks of fashion to become a universal garment that can be found as outerwear on people of all genders, ages, and ranks. And for every type of t-shirt wearer out there, there’s a different style waiting. That’s where Threadless comes in. If you’ve never been, Threadless is a web retailer that specializes in graphic t-shirt designs. Designers submit their work, and the community votes. The favorites get made into t-shirts and then we get to purchase cool threads with which to show off our sartorial flair. Because submissions are totally open, you get a really wide and stunningly creative range of designs. Personally, I think they’re a pretty snazzy company, and I’ve bought several of their shirts over the years. 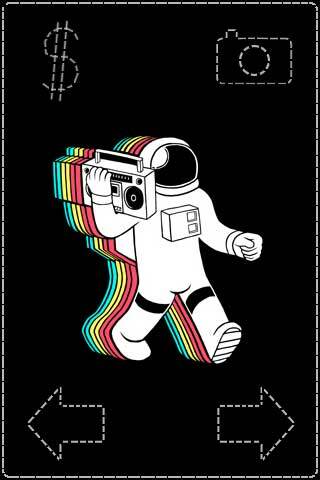 Now, the Threads app is a little different from the regular Threadless site, but it’s equally cool. Instead of giving you lots of pictures of t-shirts, they just show you the design, and it TOTALLY works. Because you already know it’s all t-shirts, all the time, this app chooses to highlight the design aspects instead, and some of these designs are truly inspired. Instead of just another a cheesy shopping app, you get a new digital gallery every week. Plus, you can use it to buy t-shirts or get free wallpaper designs! A little slow to load, but very easy to use, the app is very minimalist in its layout, with a centered design and simple outlined arrows for swiping to the next design. Dollar and camera icons allow you to…uh oh. And here is Threads main bit of awkwardness; you can’t buy directly through Threads; it will load a Threadless page in Safari for you, and instead of taking a picture, the camera button just gives you instructions for how you can take your own picture and set it as your wallpaper. It does strip out the buttons for a clean image, which is nice, but it would have been a lot nicer if the camera button would just take the picture for me. It’s also difficult to browse through all the designs, since you have to cycle through all of them from the beginning every time. A bookmark feature or a thumbnail gallery would have been appreciated. All the same, for a shopping app, Threads is easily one of the most elegant around, and I genuinely enjoyed flicking through the designs. If you have any desire for art, design, t-shirts or interesting wallpapers in your life, do yourself a favor and get Threads already. AppSafari review of Threads was written by Tracy Yonemoto on April 9th, 2010 and categorized under App Store, Art, Free, Photos, Shopping. Page viewed 5817 times, 1 so far today. Need help on using these apps? Please read the Help Page.